Once a blighted industrial area, SoHo is one of New York City’s most affluent communities. A new book explores artists’ role in the neighborhood’s transformation. Toward the middle of the 20th century, the tiny area south of Houston Street in lower Manhattan was largely a manufacturing district, home to printers and garment makers housed in cast-iron loft buildings. As businesses gradually began to leave the city, part of a larger American trend of urban deindustrialization, a different demographic moved into the area—artists who repurposed and reinvented the lofts and created a new model for city living in the process. Over the next several decades, the neighborhood now known as SoHo filled up with galleries, restaurants, and retail outlets, eventually transforming it into the wealthy area it is today. 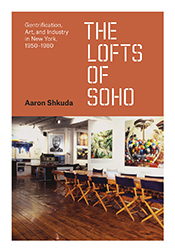 In The Lofts of SoHo: Gentrification, Art, and Industry in New York, 1950–1980 (University of Chicago Press, 2016), Aaron Shkuda, AB’03, AM’05, PhD’10, explores the details and nuances of this transformation, discussing everything from the political organization of artists who wanted to legalize their loft rentals—today only apartments with a certified artist are legal in SoHo, though the regulation is largely flouted—to the specific ways that lofts changed from factory floors to residential spaces. Throughout the book, Shkuda argues that SoHo’s artist community showed the potential for arts-led development to change and vitalize urban areas. Shkuda’s comments below have been condensed and edited. You write that the model of SoHo works against the city government's idea of urban renewal for the area. Can you explain how? There were plans from the 1920s to replace SoHo with a highway. The idea was that this neighborhood was so valueless, the industry was so marginal, that it would probably be much better to create a highway across Broome Street to connect the Williamsburg Bridge and the Holland Tunnel. That would allow people to move to the area more quickly, and in particular allow the folks who worked in the Wall Street financial services industry to get to their jobs. But thankfully, by that time people were getting pretty tired of highway building—it was expensive, it was disruptive, it ruined communities. So that idea finally died. In the early 1960s, there were short-lived plans to replace the whole 12 block area in SoHo with a middle income housing project. There was an urban planning professor named Chester Rapkin who was commissioned to do a study, and he found that the area was actually a valuable industrial incubator for lower-skill jobs, those that the city’s African American and Latino population were working in disproportionate numbers. Given that this was at the height of the civil rights movement, this argument really took hold. But in Rapkin’s report it’s not called SoHo. There was no mention of artists at all. One of the arguments against creating a housing project there was that they said nobody would want to live in the area. It was so far away from everything habitable that it served better as an industrial zone. What’s interesting is how long that process of artists moving in took. We live in this age of hypergentrification. The turnover from disinvested neighborhood to lawyer enclave seems to happen at an incredible speed, especially in New York and San Francisco. But artists didn’t really start to move into SoHo until maybe the late ’50s or early ’60s, and it wasn’t until 1975 and 1976 that there began to be this presence that looks like gentrification now. And artists and the industrial businesses supported each other because they both could rent space. A manufacturing business may have had the third floor, and an artist may have had the first and the second. It wasn’t until the demand was driven up by the mid-1970s that you start to see displacement. But that story was tricky too, because it’s not artists who were getting displaced, it was industrial businesses who were getting displaced. Sometimes it was artists or quasi-artist developers who were displacing other artists and businesses. Most of the time, to be honest, it was the people who owned a loft building for six generations and were seeing a way to profit. They were the ones kicking out their own industrial tenants. It was a messy, complicated process. Can you explain the curious twist you note in the book, where artists initially organized to live in SoHo legally but ended up campaigning to preserve their illegal status? I think that gets to the question of what SoHo teaches us about what we can do now. There’s a real tension to how you make a city affordable and livable for artists, because artists do good things for everyone. So I think one of the things that kept SoHo affordable for a period of time is that only artists can live there from 1971 on, and that suppresses the market a little bit. It created a level of affordability. One of [my interview subjects], Jared Bark, mentions this, that it seemed that only artists were willing to undertake the risk required—both the financial risk of investing in a loft that was illegal [before 1971], and maybe the sort of personal risk of undertaking some renovations themselves. And then the city government finally got around to saying, “Let’s just legalize this, it’s better than people living there illegally.” And the artists said, “No, we don't want this. We want it to be illegal so we’re the only ones who are willing to do this.” The city wasn’t really ready to go along with that, so they kept one area north of Houston Street for artists only, and they opened up TriBeCa, which is now this bedroom community for Goldman Sachs and other big financial services companies. But I think that’s the sort of twist, and in a way that’s the beginning of the end of SoHo, and of the loft as sort of an artist-only phenomenon, because for the first time, you get NYC sanctioning this process for anyone. It’s sort of a last gasp. You also write about the city’s efforts to name a street after Jackson Pollock. Why were the artists opposed to that? This is one of the times where the artists start realizing they are walking a fine line. It’s clear they have some idea the popularity of this form of [loft] housing to nonartists is going to be helpful to them. But they also worry that this could go too far, and I think Jackson Pollock Boulevard is one of those times where they say, “We’re not going to brand this as the new art world.” It was also the sense that some of them saw themselves in competition with Jackson Pollock. They were also abstract expressionist painters. Jackson Pollock never lived in SoHo. It’s not the right name. Were there divisions within the artist community in SoHo? There was clearly conflict there, and the biggest one was between the owners and the renters. People who bought in early on were in a much more stable position when it came to loft legalization. They could be evicted for living there, but they weren’t going to lose their property. If you rented, you were ready to lose everything. One of the challenges of writing histories is that phrase, history is written by the winners. It happens in SoHo too. You get the groups that are pushing for legalization, they have records, and they make it into the press. The people who are sort of silently stewing about this and worried about being found out, they’re not leaving records. This is the challenge of studying gentrification to begin with or urban studies in general. In SoHo, some people get up and leave. They vote with their feet, and they sell their loft, and move on to the next place that feels a little more like home.